Hyde Park, NY – The 2017 Menus of Change Annual Report was released today at the 5th Annual Menus of Change Leadership Summit by the chairs of the initiative’s two advisory councils. Menus of Change®: The Business of Healthy, Sustainable & Delicious Food Choices is a ground-breaking leadership initiative launched in 2012 by The Culinary Institute of America and the Harvard T.H. Chan School of Public Health. It works to realize a long-term, practical vision integrating optimal nutrition and public health, environmental stewardship and restoration, and social responsibility concerns within the foodservice industry and the culinary profession. The conference is held at the CIA’s Hyde Park, NY campus, where more than 400 executives, experts, investors, and innovators in food, foodservice, health and nutrition, and sustainability are in attendance. 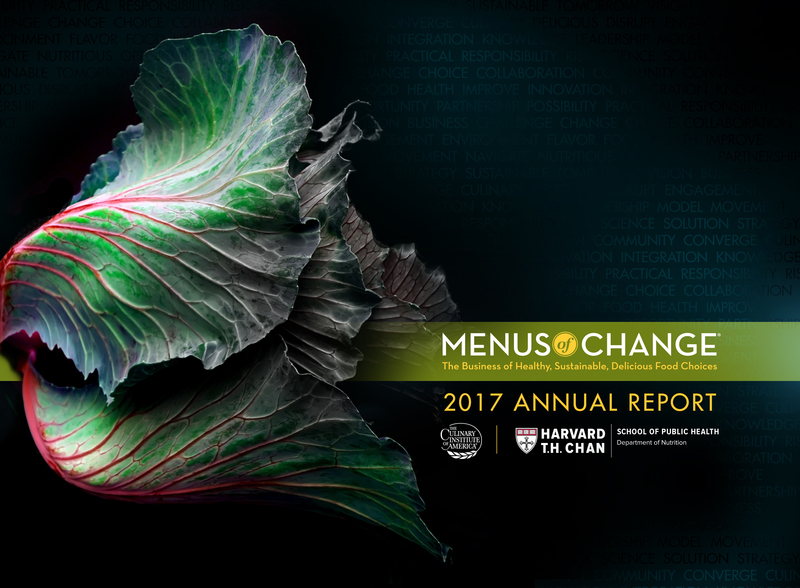 Included in the 2017 Menus of Change Annual Report are updates on the latest nutrition science and environmental issues, case studies, and a performance dashboard that measures progress towards improving nutrition, sustainability, and profitability in the culinary profession. Overall, the industry is making substantial gains, good progress, or at least holding steady on 13 of the 16 key issues. Performance improved in efforts to shape consumer attitudes and behaviors about healthy and sustainable foods, as well as the industry’s role in improving animal welfare. But the industry took a step back with regard to fish, seafood, and oceans, as well as diet and health, where progress slowed compared to last year, primarily due to an alarming continued rise in adult obesity rates. Garnering the lowest marks were water sustainability and climate change, which remain the two areas of greatest concern for the foodservice industry. Today marks the celebration of the fifth year of Menus of Change, whose thought-leadership includes making plant-forward dining a mainstream concept among foodservice professionals and a burgeoning one among diners. One of the most important new features in the 2017 report is a concise, evidence-based framework around the term, which is informed by the 24 Principles of Healthy, Sustainable Menus. Menus of Change defines plant-forward as: A style of cooking and eating that emphasizes and celebrates, but is not limited to, plant-based foods—including fruits and vegetables (produce); whole grains; beans, other legumes (pulses), and soy foods; nuts and seeds; plant oils; and herbs and spices—and that reflects evidence-based principles of health and sustainability. Over the next two days, conference attendees will hear from a world-class roster of presenters including foodservice executives, members of the media, leading nutrition and climate scientists, corporate sustainability leaders, investors, and some of the country’s top chefs exemplifying the tremendous culinary potential and business opportunities surrounding plant-forward menus. These include: Jonathan Farnell, CEO of the EAT Foundation in Stockholm, Sweden; Scott Uehlein ’85, vice president of product innovation and development at Sonic Drive-In; researchers from the Johns Hopkins Bloomberg School of Public Health; Victor Friedberg, co-founder of S2G Ventures; and many others. Breakout sessions include topics from strategies for scaling regenerative agriculture to new business models and case studies in shifting menus toward more plant protein. There are also Q&A sessions and culinary presentations by renowned chefs including Daniel Giusti ’94 of Brigaid and Dan Kluger of Loring Place. All conference general sessions are being streamed online and will be available for viewing and sharing at any time. The full program schedule and biographies of all the presenters can be found on menusofchange.org. Throughout the year, Menus of Change continues to provide cutting-edge insights on issues facing the nearly $800 billion foodservice industry. Together, the CIA and Harvard are working to foster innovative business ideas and delicious menu concepts that address the issues in the report dashboard of greatest concern and lowest attention to date. While obesity, climate change, and water scarcity can be daunting topics, by improving consumer attitudes about healthy and sustainable foods, making great strides around protein options in particular, and demonstrating progress in many other key indicators over just a few years, the leaders of the American foodservice industry have shown they are up to the task. Harvard T. H. Chan School of Public Health brings together dedicated experts from many disciplines to educate new generations of global health leaders and produce powerful ideas that improve the lives and health of people everywhere. As a community of leading scientists, educators, and students from around the world, we work together to take innovative ideas from the laboratory to people’s lives—not only making scientific breakthroughs, but also working to change individual behaviors, public policies, and health care practices to create a healthier world. For more information, visit www.hsph.harvard.edu/nutritionsource/.